Paris Police observed a motorcycle traveling 76 mph on a 30 mph zone in the 700-block of S. Main Saturday morning at 1:50. The officer attempted to stop the vehicle, and after several turns, the driver stopped and identified himself as Landon Edward Smith, 26, of Paris. They arrested Smith and charged him with evading arrest or detention with a vehicle, reckless driving, failure to display a license tag on the bike, and no motorcycle operators license. Smith was booked into the city jail and later transferred to the Lamar County Jail. Paris Police responded to a report of an assault in the 1000-block of Connor Friday evening at 9:29. Reportedly, a female’s boyfriend had assaulted her by choking. The suspect left the scene before she called officers. The investigation continues. Paris Police are looking for a white Ford F-150 pick-up that was involved in an accident in the 1300-block of NE 20th St Saturday morning at 2:09. Reportedly, the vehicle traveling northbound crossed over the center stripe and sideswiped a 2015 Toyota Camry. The 19-year-old driver and a 20-year-old passenger complained of injuries but refused medical treatment at the scene. The investigation continues. Paris Police stopped a vehicle in the 800-block of Fitzhugh Saturday morning at 10:59, for displaying fictitious registration. 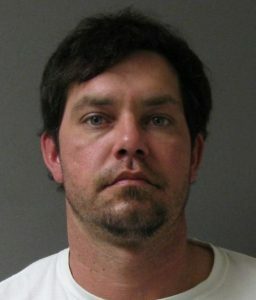 The driver, Ray Austin Griffin, 35, of Paris, was found in possession of methamphetamine. He was arrested and placed in the Lamar County Jail. Paris Police responded to a burglary of a residence in the 1200-block of E. Booth Saturday evening at 7:09. A possible known suspect had entered the house and taken a laptop computer. The incident is under investigation. Paris Police observed a vehicle parked on the wrong side of the roadway in the 600-block of W. Cherry Sunday morning at 4:03. Officers detained the five occupants and discovered two had cocaine. 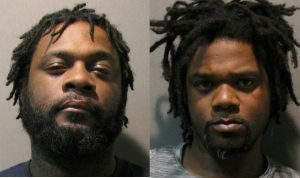 Mantrall Deon Mason, 30, of Paris, and Broderick Devon Henderson, 34, of Topeka, Kansas, were arrested and charged with possession of a controlled substance. Mason had given a false name, and later officers discovered a warrant out of Lamar County charging him with possession of marijuana. Henderson owned marijuana and had a felony warrant charging him with criminal nonsupport. They arrested a third person for possession of marijuana. They are in Lamar County Jail. A 2003 grey Chevrolet pick-up was reported stolen in the 4200-block of Lamar Sunday afternoon at 5:37. The owner was working when he observed the vehicle leaving the parking lot. Officers later found it abandoned in the 500-block of NE 31st St. The owner advised that the only things missing were the keys to the vehicle and a backpack containing a school laptop computer. The incident is under investigation. Paris Police responded to a disturbance in the 500-block of NW 4th Monday morning at 3:18. Reportedly, William David Weets, 28, of Cooper, was arrested and charged with aggravated assault with a deadly weapon. The report states that Weets had arrived at the location with a friend and was acting strangely. 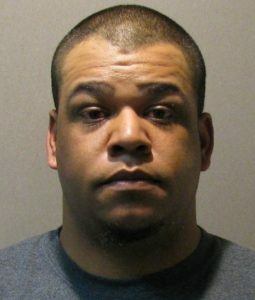 Weets attempted to strangle a dog with an extension cord, and when the victim tried to stop him, Weets then choke the victim with the same wire. Weets is waiting for transfer to the Lamar County Jail. Paris Police detectives executed a search warrant on a residence in the 1000-block of SE 29th St on Friday. Inside the house, officers located approximately three and a half pounds of marijuana, about 28 grams of THC concentrate, and around three grams of MDMA tablets. 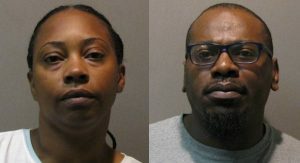 Officers arrested Nakia Oneauta Grigsby, 36, and Johnny Laroyce Blake, 39, both of the residence and charged them with two counts of manufacturing or delivering a controlled substance in a drug-free zone and possession of marijuana of more than four ounces but less than five pounds. Both are in Lamar County Jail. Paris Police responded to 261 calls for service and arrested 22 people over the past weekend ending at midnight Sunday (Mar 31).